New York: Alfred A. Knopf, 1970., 1970. First edition. First collected edition. With a previously unpublished autobiographical foreword by the author. This copy is inscribed by the author to his attorney, "For Harris [Seed], old reader and good friend in case he ever runs out of reading matter, Ken." Cloth spine lightly soiled, else fine in a bright, crisp dust jacket. Collects "The Galton Case," "The Chill," and "Black Money." New York: Alfred A. Knopf, 1970. Bright yellow cloth with silver titles in decorated dust jacket. Stain to front endpaper and a little soiling to edges in a very sharp dj. Inscribed by the author "For________with my best regards, Ken Millar (Ross Macdonald)" on the title page. This omnibus volume collects The Galton Case, The Chill and Black Money.. Inscribed by the Author. 1st. Cloth. VG/About Fine. Octavo. New York: Alfred A. Knopf, 1970. A beautiful copy of the first printing. Fine condition in a Fine dust jacket. NOT price clipped ($7.95, 04/70). Protected by a removable Brodart clear-plastic sleeve. NO chips. NO tears. NO creases. NO rubbing. NO fading. Bright, shiny, clean, square and tight. Sharp corners. NO owner's name or bookplate. NOT a remainder. Pages are creamy white, fresh, crisp and unmarked. 1970. First printing with "First Edition" so stated on the copyright page. ARCHER AT LARGE is the First Collected Edition of three previously published Lew Archer novels. It contains: THE GALTON CASE , THE CHILL , and BLACK MONEY . It also has a new 5-page Foreword by the Author [in 1981 this foreword by Macdonald was reprinted in the Capra Press limited edition, SELF-PORTRAIT, CEASELESSLY INTO THE PAST. See Bruccoli A31]. Top edge tinted yellow. This copy agrees in all respects with the first printing as described in the standard Ross Macdonald bibliography by Matthew J. Bruccoli. Bound in the original yellow cloth, stamped in red and shiny silver. Complete with gorgeous dust jacket. Bruccoli AA2.. First Edition (so stated). Hardcover. Fine condition/Fine dust jacket. Illus. by Summit, S. A. (jacket design). 8vo. (xii), 628pp. Great Packaging, Fast Shipping. Alfred A Knopf, 1970. Yellow cloth binding, red & gilt titles, yellow topstain. Stated first edition. Book unread, fine. DJ ($7.95; 04/70) near fine with slight rubbing, edgewear at spine.626 pp.. First Edition. Hardcover. Fine/Very Good. Book. 1970-07-01. New. Ships with Tracking Number! INTERNATIONAL WORLDWIDE Shipping available. Buy with confidence, excellent customer service! Alfred A. Knopf. Used - Good. Ships from the UK. Shows some signs of wear, and may have some markings on the inside. 100% Money Back Guarantee. Your purchase also supports literacy charities. Random House Inc (T). Hardcover. 9997402502 . New. NY: Alfred A. Knopf. F. 1970. 1st Edition. Hardcover. Stated first edition bound in orange cloth with silver lettering. A Fi ne copy in a Near Fine dust jacket. Fading to the jacket's spine. 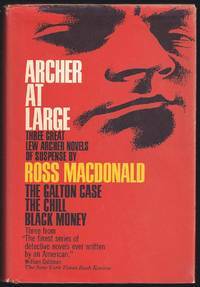 Cont ains three Archer Novels: "The Galton Case", "The Chill", and "Black M oney". .
Random House Inc (T). Hardcover. 9997402502 New Condition. . New. 1970-07-01. Good. Ships with Tracking Number! INTERNATIONAL WORLDWIDE Shipping available. May not contain Access Codes or Supplements. May be ex-library. Shipping & Handling by region. Buy with confidence, excellent customer service! New York: Alfred A. Knopf, 1970. First edition of this collection. A near fine copy, small nick to cloth at upper spine in a near fine dust jacket. (9934). Octavo, cloth. Omnibus of three previously published Lew Archer novels, The Galton Case, The Chill and Black Money. New introduction by the author. Pederson (ed. ), St. James Guide to Crime and Mystery Writers, (4th ed. ), pp. 676-678. New York: Knopf. First printing. Hardcover. Near Fine/very good +. A first printing of this omnibus edition containing "The Galton Case", "The Chill" and "Black Money". This very lightly read copy is clean and tight with some very light wear on the bottom edge. The DJ is bright and crisp with a slightly faded spine and very light wear at one corner. Random House Inc (T). Hardcover. 9997402502 . Fine. Random House Inc (T). Hardcover. 9997402502 Like New Condition. . Fine. Knopf Contains "The Galton Case", "The Chill" and "Black Money" hardcover - 626 pages - very fine condition ABE-035. Alfred A Knopf, NY. Used - Good. Shows some signs of wear, and may have some markings on the inside. N Y: BARZOI/ A A KNOPF, 1970. three novels in one book. GOOD NO DUST JACKET. Alfred Knopf. Hardcover. NO Dust Jacket Good condition but not perfect, Cover has minor nicks and tears, spine shows some creases from use. Ask Questions and request photos if your buying for the cover and not the content. STOCK PHOTOS MAY VARY FROM THE ACTUAL ITEM. ACTUAL PHOTOS AVAIL. UPON REQUEST. . Good. 1970. New York: Alfred A. Knopf, 1970. Good. First edition. Good minus Spots and scrapes on the cover. Goodutter torn. Edges and corners are slightly rubbed. Slightly off of its binding. Large Spine Lean. Pages are beginning to yellow on edges. Three Exciting Novels: The Galton Case The Chill Black Money With Foreword by the Author. Please Note: This book has been transferred to Between the Covers from another database and might not be described to our usual standards. Please inquire for more detailed condition information. Alfred A. Knopf. Hardcover. B002YMP7MS Quick--Ship! Square and tight 1970 BCE/ BOMC hardcover w/ clean & unmarked LIKE NEW pages/ text block, outside page edges and cover. Clean and bright dust jacket protected w/ removable and clear, acid free archival sleeve w/ Like New front panel -- except for 1/8 th inch "invisible" closed tear at bottom, thus overall VERY GOOD; a Like New back panel -- except for a few small scuff spots/ paint dings, thus overall VERY GOOD, and a Like New spine panel -- except for really light, almost unnoticeable, stress lines at top, thus overall FINE. Beautiful book and, in appearance, overall beautiful DJ. Ships within 24 hours--w/ tracking # and packaged w/ four levels of protection. ( 19e30) . Very Good. 1970. New York: Alfred A. Knopf, 1970. Book club edition hard cover with dust jacket, VG/VG. Clean, tight, unmarked copy. Boards slightly scuffed. Dust jacket has a shallow chip at spine head and a short, closed tear to top of rear panel, offered in new mylar. 626pp.. Book Club. Hardcover. Very Good/Very Good. 8vo - 8" - 9" Tall. New York: Alfred A. Knopf, 1970. Cover is bumped at corners. Pages are browning.. Hard Cover. Good/Good. 8vo - over 7¾" - 9¾" tall. New York: Alfred A. Knopf, 1970. Dj sunned with sticker inside. Out of print. Pages are clean, text is unmarked, binding is tight. . Hard Cover. Good/Fair. 8vo - over 7¾" - 9¾" tall. New York: Alfred A. Knopf, 1970. Cover is worn and tearing at spine. Pages are browning. 3 Stories in 1 Book. The Galton Case, The Chill, and Black Money.. Hard Cover. Good/No Jacket. 8vo - over 7¾" - 9¾" tall. Hardcover. Good. Good used condition, shows average signs of use or wear for its age. Ships fast & secure, expedited available! NY: Alfred a Knopf, 1970. Cover is bumped, scuffed. Pages are clean and tight. Library pocket in book.. Hard Cover. Good/No Jacket. 8vo - over 7¾" - 9¾" tall. Ex-Library. New York, New York: Alfred A. Knopf, 1970. Hardcover. Good/Good. 8vo - over 7¾" - 9¾" tall. Bce. (Book Club Edition). Includes: The Galton Case; The Chill And Black Money. The Book Is Bound In Tan With Black Lettering On The Spine. Minor Wear With The Page Edges Lightly Tanned. Light Bump To The Lower Back Corner. The Jacket Has Wear And A Few Small Chips And Tears. Former Owner's Signature Near The Lower Edge Of The Front Flap. Random House Inc (T). Hardcover. 9997402502 Very Good Condition. Crisp pages. Tight binding. Great reading copy. Name/Mark of previous owner in front. Slight shelf wear on cover. Some tanning. Some rubbing wear to cover edges. Small tears in cover. - All books inspected inside and out and shipped by USPS with a tracking number! I highly suggest that you choose expedited shipping. For a small fee you get priority shipping, insurance and a padded envelope for the best protection. . Very Good. Alfred A. Knopf. Used - Very Good. Very Good condition. Good dust jacket. Alfred A. Knopf. Used - Good. Good condition. Acceptable dust jacket. Book Club edition. Slightly dampstained. Random House Inc (T). Hardcover. 9997402502 Book is not new, but in good condition. Cover in very good condition. DJ has minor rubbing, moderate chipping, and tearing. Pages are clean and tight. Buy with confidence...customer service is our TOP PRIORITY! Quick Shipping/ Free Delivery Confirmation! . Good. Random House Inc (T), 1970. Hardcover. Good. Disclaimer:A copy that has been read, but remains in clean condition. All pages are intact, and the cover is intact. The spine may show signs of wear. Pages can include limited notes and highlighting, and the copy can include previous owner inscriptions. At ThriftBooks, our motto is: Read More, Spend Less.Dust jacket quality is not guaranteed. Random House Inc (T), 1970. Hardcover. Acceptable. Disclaimer:A readable copy. All pages are intact, and the cover is intact. Pages can include considerable notes-in pen or highlighter-but the notes cannot obscure the text. At ThriftBooks, our motto is: Read More, Spend Less.Dust jacket quality is not guaranteed. Alfred A. Knopf. Hardcover. B002YMP7MS Very Good Condition. Has some wear. Five star seller - Buy with confidence! . Very Good. Alfred A. Knopf. Hardcover. B002YMP7MS Good Condition. Has tearing. Five star seller - Buy with confidence! . Good. Random House Inc (T). Hardcover. POOR. Noticeably used book. Heavy wear to cover. Pages contain marginal notes, underlining, and or highlighting. Possible ex library copy, with all the markings/stickers of that library. Accessories such as CD, codes, toys, and dust jackets may not be included.